Admin area is the first page that the website admin can browse. WordPress admin area can be the most informatable page for the admin in the website. This page should be comfortable and accessible to give you the most important information that you need and control all the website. This article will help you to make the most comfortable admin area as you want by customizing it. You’re the only person with access to your admin panel and you just want to change its appearance or functionality. You run a membership site, BuddyPress, or other type of site where users are regularly logging into WordPress. 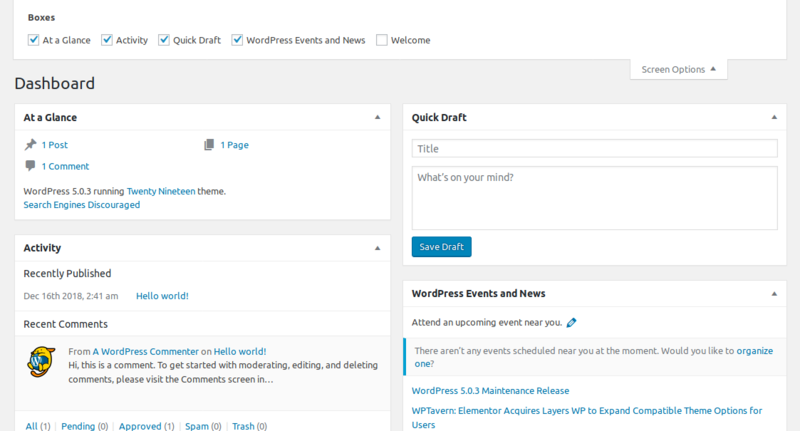 You’re a WordPress designer who wants to provide a client friendly admin section. As you can see in the top right of the page there is a scroll called “screen option”. When you press on it, you can see more options that can give you the ability to add parts or remove it. The number of these parts depends on the number of plugins you have and if you can control them from the dashboard or not. When you are in the panel page for posts, you can use the same button “screen options” to drag and drop or remove and add any other component to the columns. You can use the same button “screen options” to customize the editorial page by the number of columns and adding or removing information like SEO, Author bio part or any other options about your theme. Even the view of comments and their number which is by default 20 comment and you can increase this number to browse the comments in the editorial page. From the button in the top right part of the comments page, you can find “screen options” which you can press on it and customize the view of the comments and their numbers. By default, logging in to the WordPress admin area requires either /wp-admin or /wp-login.php in the URL, which isn’t a lot to type. You can, however, make it even easier by changing the login URL to something more memorable and better branded. This technique requires .htaccess file manipulation. Usually, this is a file hidden in the root of your WordPress installation. It’s automatically created by WordPress after setting custom permalinks using URL rewriting. Just replace the login keyword with one of your choice and your website’s URL. Now, open your favorite browser and go to http://yoursite.com/login. You’ll be redirected to the WordPress login page. Remember that your clients are not supposed to know everything about WordPress usages a user-friendly URL is far better to remember than /wp-login.php.